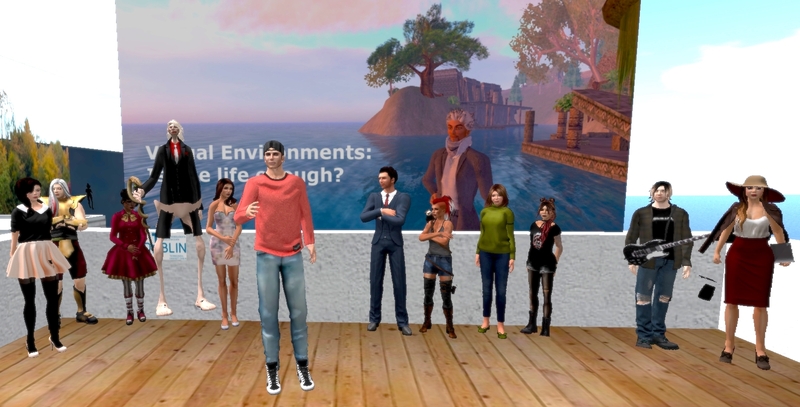 February | 2019 | Virtual Environments: Is one life enough? Guest speaker Sitearm Madonna talks about partnership team building. We were joined by guest speaker Sitearm Madonna this evening. Sitearm is a graduate of the module, a former engineer in the US oil industry, expediter of projects in virtual worlds and musician, with extensive experience of team work. He spoke to the slides that will remain in the classroom for the rest of the semester. We were also joined by Dudley Dreamscape, another graduate of the module, professor at the University of Akron and guest speaker in a later class. John noted that both Sitearm and Dudley had performed so well on the module that they scored the highest marks ever awarded. Sitearm started by asking us all to think of a time when we felt good about working on a team and to write down one word that would remind us of the experience later in the class. We were also asked to repeat the exercise for a time we had negative memories of a team. He emphasised that teams generally get projects completed, no matter how badly they perform. The aim is to continually strive to achieve better outcomes by supporting team development. This starts by building commitment and competence. Team members need time to get to know one another informally, in addition to the formal engagement, so they can perform effectively together. Best practice for building teams that produce results. Recognising the stages of team development is essential for managing time and ensuring that all members can contribute meaningfully. Each stage requires a different type of input and engagement. For example, when the team is in the ‘forming’ stage members may need to spend more time working together to develop cohesion whereas the ‘performing’ stage might require each member to complete their own contribution independently. Sitearm also described the practices of team work: brainstorming, deciding, briefing, and debriefing – explaining when and how to activate each one. Throughout all of this team members will constantly play different roles. When decisions need to be made it is important to have someone in the role of ‘coordinator’ or ‘shaper’ whereas ‘specialists’ and ‘team workers’ are essential to putting the project into production. 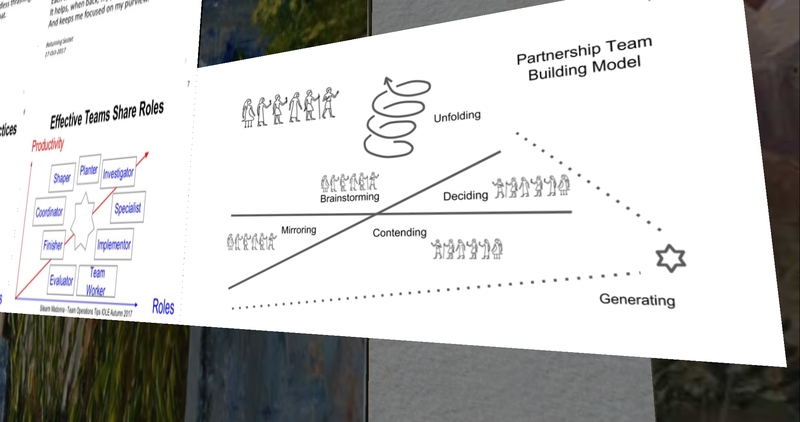 Sitearm concluded by showing us his newly developed Partnership Team Building Model. It demonstrates the work a team needs to do in order to reach the goal of generating an outcome. Following his presentation Sitearm asked for contributions based on his questions at the beginning of class. There were many good examples given such as Aestheicant’s experience of a team that worked well because everyone felt able to amend and improve on ideas; EvaKKCara’s satisfaction when a committed and hard-working team gained a tangible outcome at the end of the process; hummush’s comment that all members helped each other on different aspects of the project brief so all felt very well informed on the aim of the project; and JCraig1988’s discovery that his opinions and ideas tended to broaden out the more he worked on a team. Equally enlightening were the examples of negative team experiences: Alik98 recalled the embarrassment resulting when the lack of communication among team members led to a disjointed and terrible presentation; robadamson was dumbfounded when team members that didn’t show up for any meetings were shocked when they received no credit for the final piece of work; YuwenXing remembered the huge amount of additional unnecessary work that resulted from an unclear division of tasks. Everyone shared experiences and examples that demonstrated the importance of preparing appropriately for team projects and continually monitoring the health of the team. Many of you hadn’t picked up on the Project Teams announced on Brightspace this week so here are the details again. Please make contact with each other and read the preparatory material for next week’s class where we will consider the brief for the Team Project. You are currently browsing the Virtual Environments: Is one life enough? blog archives for February, 2019.